Urinary tract infections (UTIs) can be painful and uncomfortable. More than one in three women will have received antibiotic treatment for the condition at least once by the time they reach the age of 24. Drink plenty of water to avoid dehydration and help clear bacteria from the urinary tract. Visit the toilet as soon as you feel the need to urinate. Unfortunately, some evidence suggests these options are often unavailable to many practising nurses. A current research study by this author exploring nurses as role models in health promotion has unexpectedly uncovered worrying data on the issue. The researcher was aware that recurrent cystitis and UTIs were accepted as a common occurrence among many nursing staff, who claimed not to have sufficient time to drink water or visit the toilet at work. About 40 nursing students, registered nurses and nurse lecturers who were involved in focus groups for the research study made similar comments that drinking and taking toilet breaks are not always possible on duty. One paediatric nurse described how, when speaking to a mother concerned that her child had not urinated for eight hours, they themselves realised that they had not been to the toilet during their 12-hour shift because they had been too busy. Causes of infrequent voider syndrome or ‘nurses’ bladder’ are said to be busyness and poor toilet facilities. Rotational shifts are also said to result in adaptive changes, such as decreased urine production and frequency, in healthy young female nurses (see resources). Many government reports urge nurses and midwives to acknowledge that they are role models for healthy living and to take responsibility for their health. The working environment must therefore support them in this task as they care for others. 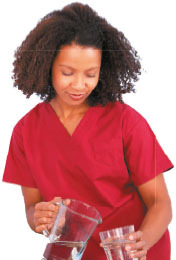 It is not too much to ask that nurses have sufficient time to drink water and go to the toilet.